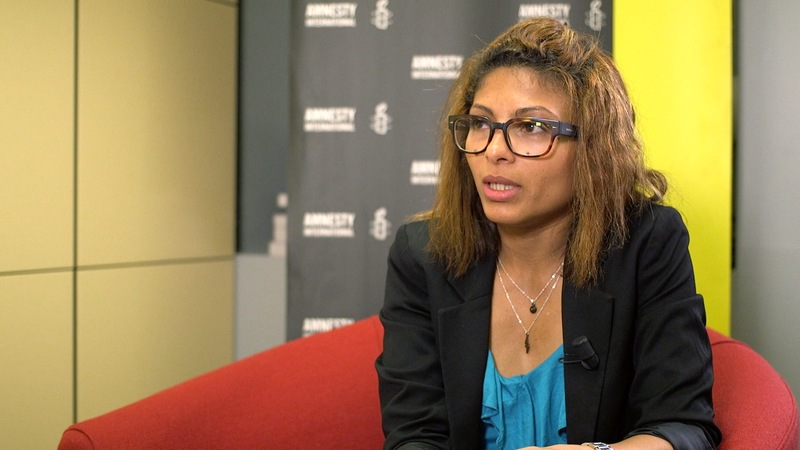 Raif Badawi could be sentenced to death for apostasy, says his wife Ensaf Haidar, who told EURACTIV she feared that her blogger husband could be publically flogged at any time. Badawi remained convinced that the fight for free expression was worth it, she said, before criticising Saudi Arabia for sending a representative to the Paris march in support of Charlie Hebdo, when it was stifling freedom of expression at home. Ensaf Haidar is the wife of Raif Badawi, the Saudi Arabian blogger jailed for ten years and sentenced to 1,000 lashes for writing on his website Free Saudi Liberals. She spoke to EURACTIV Deputy News Editor James Crisp. When was the last time you saw your husband? It’s been a long time. Three years. How do you stay in contact with Raif? I speak with him on the phone. He calls me. But now it has been six days, and I haven’t heard from him. It must be very hard for you and your children. Yes it is very difficult. It is all about waiting and missing each other, so it is very difficult. He is strong. He still believes in what he did and he stands by his beliefs. But at the same time, it is still a very difficult situation, with the uncertainty over what may be happening, and the fact he is a long way away from his children. It is definitely difficult. What is his current legal situation? The flogging was stopped initially on health grounds. A committee of eight doctors stopped the flogging. However, the situation is still unknown. We don’t know if they will begin the flogging again at any time. You don’t know from one day to the next if the sentence will be resumed? And he could still be accused of apostasy, which carries an automatic death penalty? Prior to his flogging, his case was sent from the Supreme Court back to the Criminal Court, which at the time had the jurisdiction to look into apostasy cases. These are considered serious crimes and carry the death penalty. After the flogging, the case was sent back to the Supreme Court. We don’t know what the discussions or the decisions were about. Has there been any change in the treatment of your husband’s case since the new King took the throne? [King Salmon took over the throne after the death of King Abdullah in January 2015. What has the international pressure on Saudi Arabia achieved so far? Can it bring results? The outcome of the international pressure so far has been to give us support and strength. Mentally, it helps Raif a lot to know that people are standing by him and will stay with him until he is released. However in legal terms, everything is still uncertain and unknown. Why are you here in Brussels? I am here to meet people and to ask them to stay by Raif’s side and by my side until he is released and reunited with his family. I am asking the Belgian government to call for the release of Raif Badawi. I am going to meet MEPs and representatives of the European External Action Service (EEAS) [The EU’s foreign affairs service]. The EEAS says they are attempting to help your husband through diplomatic measures. Is that enough? I really thank them a lot for what they are doing and I will not comment if it is enough or not enough. I will ask them if it is possible to keep doing all they can until Raif is released. Where you surprised after the Charlie Hebdo shootings to see representatives of Saudi Arabia marching for freedom of expression in Paris? I was very surprised. It was a shame for [Saudi Ambassador to France, Mohammed Ismail Al-Sheikh] to be there, protesting against terrorism, especially when what they are doing in Saudi Arabia is similar – flogging is barbaric. After his death, many EU leaders described the last king as a force for reform despite your husband’s sentence. I prefer not to comment on that. Does your husband still believe that his freedom of expression is worth the suffering you are all going through? He still thinks that freedom of expression is worth it. He is still strong and he will not back down. I hope he will not back down and I hope he is released. An EU foreign affairs spokesperson told EURACTIV, “The basis and conditions of Mr Badawi’s sentence, as well as the nature of the punishment handed down to him, are matters of strong concern for the EU. In addition, the sentence appears overtly disproportionate. “In close coordination with EU member states, several formal and informal outreach initiatives towards the Saudi authorities have been conducted, both in capitals and locally. A positive development has already been achieved with the suspension of the carrying out of the lashing sentence since 9 January, although officially on health grounds. For those going to Saudi a couple of suggestions. Fridays – try and not be in towns in Saudi on Fridays – you may find yourself on the front row watching somebody getting their head chopped off (the victims are obliged to kneel in the gutter outside the mosque after mid-day prayers). Dahran is particularly to be avoided. Hand chopping is popular – but chopping is not technically correct since the tool of preference is a tennon saw – hands usually end up dangling by a piece of string from a lamp-post (warning to others). Saudis (some/many/all?) tend to regard non-Saudi women as animals as in “I’m just exercising my animal” said a Saudi doctor to a colleague as he raped a Philippina nurse (Jubail hospital). Psycopaths & those with strong right arms (helps if you are also a muslim) will be interested to know that there are openings in Saudi for public executioners. & let’s not forget EU countries compete to sell weapons & all sorts of other things to a country that is a stain on humanity and an insult to evolution.